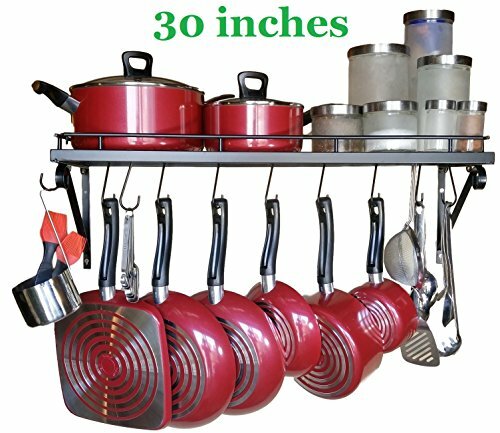 30'' Wall mounted pots and pans rack. Pot holders wall shelves with 10 hooks. Kitchen shelves wall mounted with wall hooks. Kitchen storage pot holder pot rack. Pot pan organizer. Pot Pan rack. Free up space in your kitchen with this wall mounted metal rack. The shelf size is 30" x 10". The wire mesh on the shelf is designed for easy hanging (10 "S" shaped hooks included) and cookware. The rack is made from quality iron matt finished to prevent rust and increase attractiveness. It can be used in the kitchen, bathroom, living room, to organize and store anything. Life time warranty. Made from quality metal matt finished to prevent rust. Attractive and durable. Life time warranty. Easy installation. Can be used in kitchen, bathroom, living room, etc to hold any items.